Elephantech Inc. (head office: Chuo-ku, Tokyo, CEO: Shinya Shimizu, hereinafter “Elephantech”) manufactures “P-Flex™”, a flexible PCB, and advocates new circuit board manufacturing methods using printed electronics technology. 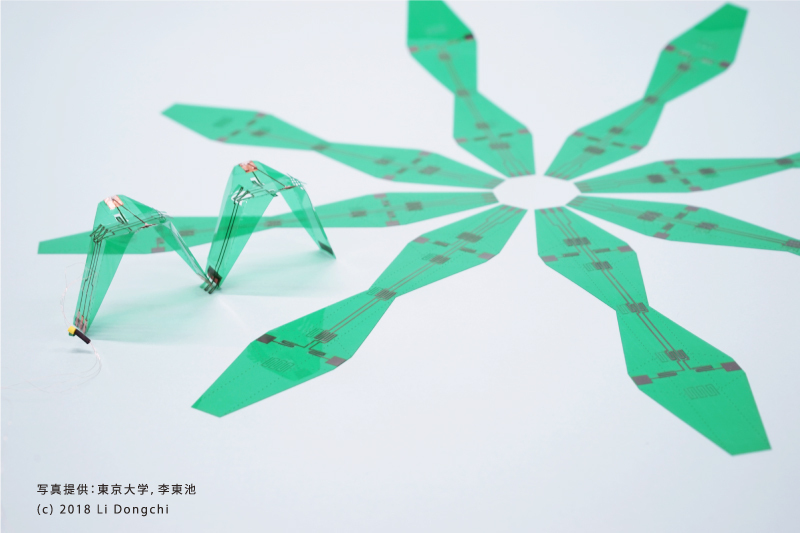 "P-Flex ™" was utilized for "Origami Robots with Flexible Circuit Sheets", a research demonstration by ERATO Kawahara Universal Information Network Project which was awarded the Best Demo Award at ACM UbiComp 2018 held in Singapore. “Demo: Origami Robots with Flexible Printed Circuit Sheets,” Adjunct Proc. of ACM UbiComp 2018, Singapore, Oct. 2018. Elephantech was founded as a result of the "Instant Inkjet Circuit" developed by University of Tokyo Associate Professor Kawahara which was awarded the Best Paper Award at UbiComp 2013. There were many people that suggested that P-Flex™, formed from Inkjet Technology with the characteristics of being thin and light, could be utilized for applications using origami. The present research demonstration was made possible by adopting Elephantech's patented "Tomoe Type" hinge structure which allows wiring to connect perdendiculary at the crease, making it possible to avoid disconnection issues at the crease. Regarding "Origami Robots with Flexible Circuit Sheets"
The robot body is manufactured by additive production and laser cutting. For the demonstration, the robot, using a shape memory alloy as an actuator, moved around smoothly along the flat surface with the characteristic rhythm inspired by the crawling movement of a caterpillar.